Which FHA 203k Loan Should You Choose: Standard or Limited? Homeowners are expected to spend a jaw-dropping $340 billion on fixing up their homes in 2018. There are many ways to finance a home construction projects but the two versions of the FHA 203k program have emerged as a popular choice among today’s home buyers and homeowners wishing to make home improvements, especially when they don’t own the home yet. The two FHA programs are known as the Standard 203k, and the Limited 203k. FHA guidelines include provisions for certain “programs”, which may provide additional assistance to homeowners. One such FHA program is its construction loan program, known as the “203k loan.” The 203k comes in two varieties — the Standard and the Limited. The FHA 203k can be used by owner-occupants of a home, local governments, and other eligible non-profits. It can be used to purchase and/or renovate a home with up to 4 units, and can be used in a multi-use building with certain exception. What is the difference between Standard and Limited 203k? The two versions of the FHA construction loan — the 203k Standard and the 203k Limited — work basically the same way. First, the Limited 203k is capped at $35,000 in repairs, and asks for less paperwork as part of the approval. The Standard 203k is not capped at $35,000 and paperwork requirements are a little more intense. 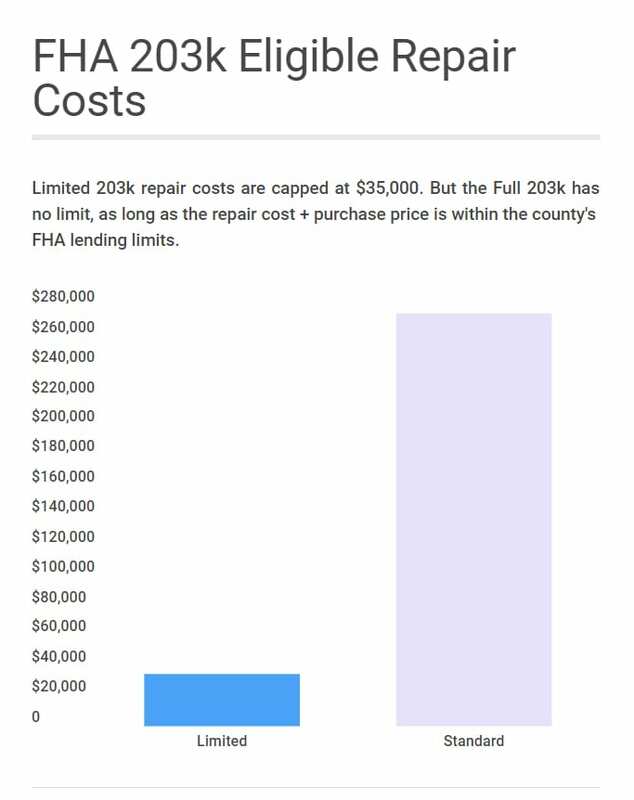 Another difference between the two 203k programs is that the Limited 203k requires that the home be “habitable” throughout the period of renovation. If the home will be uninhabitable for any reason at any time, use of the Standard 203k is required. However, borrowers using the Standard 203k can add up to six months of mortgage payments to their construction loan for the period during which the home is uninhabitable. A third difference is that, with the Limited 203k, payments to a contractor can be handled in two phases. The first payment can be made at the start of the project (i.e. 50% down to start the work); and, the second payment can be made at the project’s conclusion (i.e. remaining 50% on the work). With the Standard 203k, payments are made differently. There is an assigned “consultant” who monitors construction, making payments as each phase of rehabilitation is completed. Which 203k Loan Should I Choose? The two 203k programs also vary in what type of work can be performed. The FHA program guidelines include a comprehensive list. Weatherization of windows and doors, insulation, weather stripping. Both loans can be a boon for those looking to buy and rehabilitate before moving in the house. The FHA 203k loan can help you purchase and/or rehab a home with less hassle and fewer costs than a traditional home construction loan. It also helps that FHA mortgage rates are low.